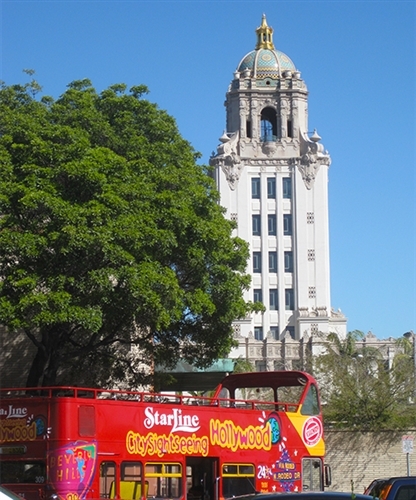 Offered by StarLine Tours, the Hop-On Hop-Off Double Decker City Tour lets guests see many of the top Los Angeles attractions, complete with narration by an expert guide. The service is made up of four interconnecting tour routes and two connector routes. Guests can choose from the Hollywood & Beverly Hills route, the Beverly Hills & Santa Monica route, the Downtown Los Angeles route and more. The easiest way to see the best of LA. Open air buses ideal for picture taking. LA Tour ticket valid for all routes, including connector routes. Narrated audio tour available in 9 languages. 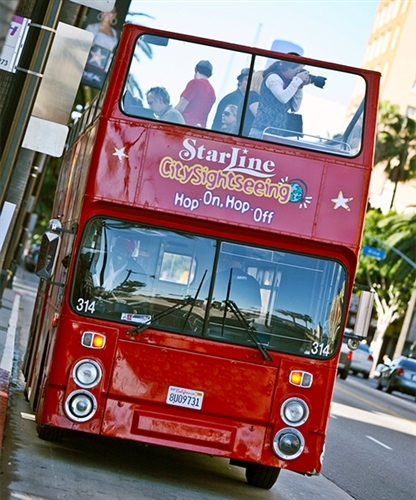 Only StarLine offers the CitySightseeing Hop-On, Hop-Off narrated Tour that enables you to see all Los Angeles has to offer from Hollywood to Beverly Hills, the beautiful landscape and beaches of Santa Monica to Downtown LA. Purchase a 24 hr, 48 hr or 72 hr pass and enjoy the freedom to experience Los Angeles on your terms. For example, hop on in Hollywood, hop off in Beverly Hills to shop, hop back on and head to Santa Monica to walk the pier and beaches and hop back on to come back and experience Hollywood and Downtown LA. It's easy, simple and fun! 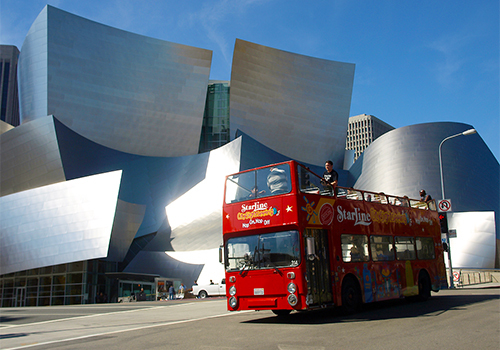 After boarding our open-air double decker bus at one of our 70 stops, you can hop-off to take in the many attractions along the route and when you are ready, hop back on to continue the tour. Just refer to the timetable section of your brochure for the next scheduled bus. Our Hop-on Hop-off service is made up of 4 interconnecting tour routes (each at least 2 hours long) and 2 connector routes. Overall our service routes cover over 100 miles! Is the ticket valid for all of the routes? 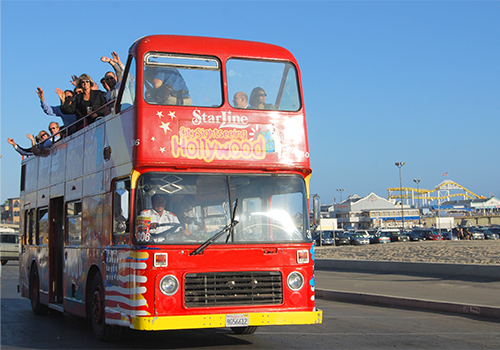 Yes, the tickets are valid for all of the 4 tour routes - RED (Hollywood), YELLOW (Beverly Hills and Santa Monica), PURPLE (Downtown LA), and GREEN (Venice and Marina Del Rey) routes, as well as the 2 connector routes BLUE (Universal) and ORANGE (LAX Hotels). Is the tour narrated, and in which languages? The tours are fully narrated - pointing out the places of interest and the history of the city. The narration is triggered by GPS and is pre-recorded in 9 languages on the RED, YELLOW, PURPLE & GREEN Tour Routes. The BLUE & ORANGE Connector Services do not have tour narration. The multilingual tour narration is available in the following languages: English, Spanish, Portuguese, Chinese (mandarin), Japanese, Korean, German, French & Italian. What are the HOP-ON HOP-OFF routes and duration of the tours? 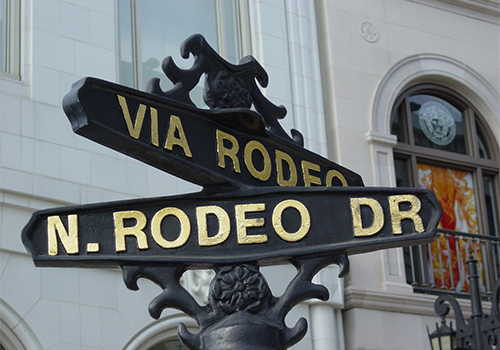 ~ RED ROUTE TOUR [2hrs] includes: Hollywood Blvd, Chinese Theatre, Sunset Strip, Rodeo Drive, West Hollywood, LACMA, La Brea Tar Pits, Farmers Market, Melrose Ave. and more! ~ YELLOW ROUTE TOUR [2hrs] includes: 3rd St Promenade, Santa Monica Pier, Montana Ave., Brentwood, Westwood, UCLA, Beverly Hills, Rodeo Drive, Century City, Westside Pavilion and more! ~ PURPLE ROUTE TOUR [2hrs 15min] includes: Olvera St., Little Tokyo, Chinatown, Jewelry District, Bradbury Building, Fashion District, LA Live, Staples Center, Walt Disney Concert Hall, Cathedral of Our Lady and more! ~ GREEN ROUTE TOUR [1hr 30 min] includes: Fisherman's Village Marina Del Rey, Venice Pier, Venice Canals, Venice Boardwalk, Main Street, 3rd St. Promenade, Santa Monica Place, Santa Monica Pier, Santa Monica & Venice Beaches and more! ~ BLUE CONNECTOR [1hr]: Connecting Chinese Theatre , Universal Studios Hollywood, Hilton Universal, Sheraton Universal and Hollywood Bowl Amphitheatre. ~ ORANGE CONNECTOR [45 min]: Connecting LAX Hotels on Century Blvd., Custom Hotel, Loyola Marymount University, OTIS College of Art & Design, Waterside Marina Del Rey and Fisherman's Village. What types of buses are used for the HOP-ON HOP-OFF? The buses for the Red, Yellow, Purple, Green & Orange Routes are open-top Double-Decker buses, allowing you to see the city from a unique perspective. The Blue Connector service is either an enclosed air conditioned or open-top shuttle bus, depending on weather conditions. What are the hours of operation for the HOP-ON HOP-OFF buses? We operate 7 days a week from 9:00am to as late as 6pm or 7pm - depending on the season. 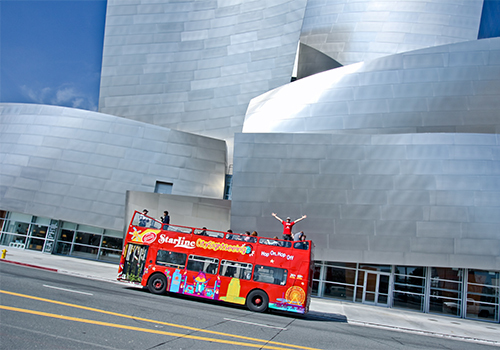 ~ Red Route starts at 9:00am from Chinese Theatre Stop (#1) and at 9.10am from Beverly Hills Stop (#7). ~ Purple Route starts at 9:30am from Chinese Theatre Stop (#1) and at 9.10am from Olvera St./Union Station Stop (#31). 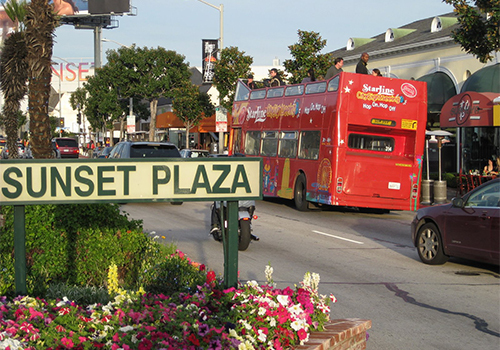 ~ Yellow Route starts at 10:00am from Beverly Hills Stop (#7) and at 9:25am from Santa Monica Visitor Information Center on Main Street Stop (#56). 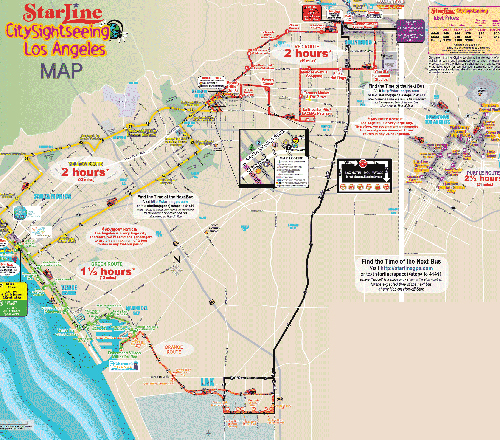 ~ Green Route starts at 9.30am from Fisherman's Village Stop (#71) and at 9.38am from Santa Monica Pier Stop (#81). ~ Blue Connector starts at 9.00am from Universal Studios Stop (#22) and at 9.30am from Chinese Theatre Stop (#1). ~ Orange Connector starts at 8.50am from La Quinta/Century Blvd. Stop (#92) and at 9.30am from Fisherman's Village Stop (#71). How do I connect from one route to another route? The Yellow Route and the Red Route connect at STOP 7 (Mon-Sat: Beverly Hills/W. 3rd St.(behind the Beverly Hills Court House) ; Sunday ONLY: Beverly Hills/Rexford Drive (outside Kelly's Coffee) - between Burton Way and Santa Monica Blvd.). The Red Route, Purple Route and the Universal Connector Service all connect at STOP 1 (The Chinese Theatre on Hollywood Blvd). The Yellow Route and the Green Route connect on different sides of Ocean Blvd. near the Santa Monica Pier at STOP 57 and STOP 81. The Green Route and the Orange LAX Connector connect at Stop 71 (Fisherman's Village, Marina Del Rey). Are HOP-ON, HOP-OFF Tours "child friendly"? Yes, children will enjoy the fun of our open-air Double Decker Buses. 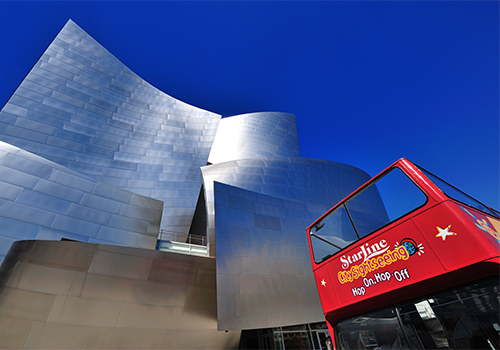 All the Starline CitySightseeing Hop-on Hop-off buses are wheelchair accessible. Starline is committed to providing accessible tours to persons with disabilities. Are strollers for children allowed on the buses? Yes, as long as it is collapsible and place in the area of wheelchairs. If there is a significant period of rain on your tour during the time of ticket usage, customers may request one 24-hour extension for your unlimited ticket. No refunds or substitutes.